The "Dimensioning" frame allows to verify joints between individual blocks of a wall against overturning and slip. Only the joints which are not reinforced by geo-reinforcements can be verified. The "Automatic verification" checks the most critical joint above the block or it is possible to perform verification for each joint. Verification according to the factor of safety, or the theory of limit states - the last column in the table allows to input the design coefficients, which multiply the calculated forces. These forces are displayed on the desktop and are updated for every change of data and setting in the frame. 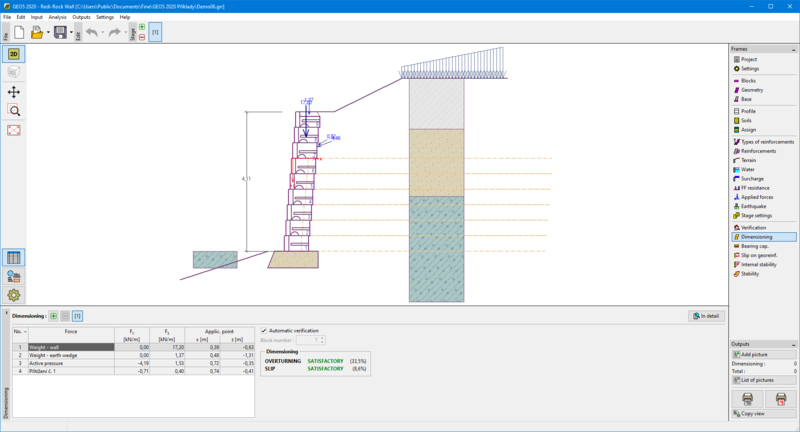 Analysis according to EN 1997 - the last column in the table allows to specify whether the load acting on a structure is considered as secondary one. This is explained in more detail in section "Load combinations". Several computations for various cross-sections can be carried out. Various design coefficients of individual forces can also be specified. The resulting forces are displayed on the desktop and are updated with an arbitrary change in data or setting specified in the frame. The "In detail" button opens a dialog window that contains detailed listing of the dimensioning results. Visualization of results can be adjusted in the "Drawing Settings" frame.